Enter Bob Vila’s 2nd Annual Fall Flooring Give-Away Today! 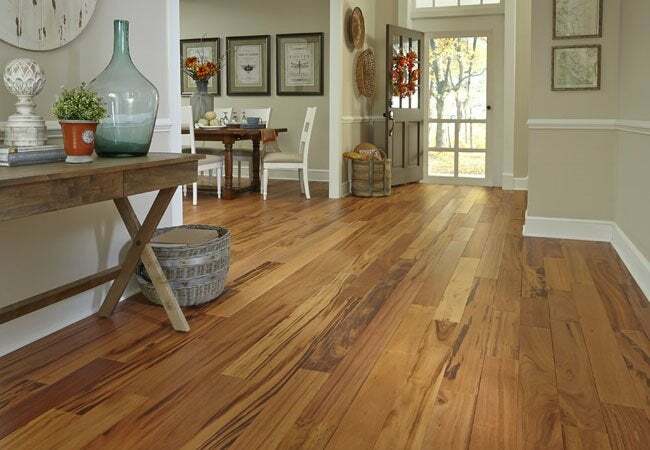 Enter to win $5,000 in flooring from Lumber Liquidators! Fall marks the beginning of shorter days, colorful leaves, and crisp temperatures, but it also marks a season of quiet evenings spent hunkered down indoors. If the state of your home leaves you feeling restless for ways to refresh your spaces, we’ve got the cure. We’ve partnered with Lumber Liquidators to transform one lucky winner’s home with a $5,000 flooring makeover. Enter today and you could be one step closer to the cozy home of your dreams. Today and every day this month (starting at 12:00 p.m. EST on August 31, 2015 through 11:59 a.m. EST September 30, 2015), enter to win a $5,000 gift card from Lumber Liquidators to put toward a flooring makeover. See Official Rules below. If you come away the winner of this month’s give-away, you’ll receive $5,000 of premium hardwood flooring, courtesy of Lumber Liquidators. Founded in 1993 by contractor Tom Sullivan, Lumber Liquidators has quickly grown into the premiere flooring retailer, offering a wide array of options for the best prices. Whether you’re looking for solid or engineered hardwood, bamboo, cork, or resilient flooring tiles, you’ll find something for every style and function online, or at one of their many locations. Lumber Liquidators also provides butcher blocks, molding, accessories, and tools so you can easily put the perfect finishing touches on your home improvement projects. • Lumber Liquidators is the largest flooring manufacturer in North America, with an unbeatable selection of unfinished and prefinished hardware flooring. • Their engineered hardwood and resilient vinyl options are extremely durable, and can easily withstand changing temperatures, humidity, and daily wear and tear. • Choose from a variety of finishes to suit your spaces, and don’t forget their easy-assemble, clickable flooring options! 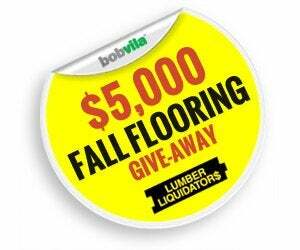 Enter Bob Vila’s $5,000 Fall Flooring Give-Away today and every day to increase your chances of winning. Bob Vila’s “2nd Annual $5,000 Fall Flooring Give-Away” is open only to permanent legal U.S. residents of the 50 states and the District of Columbia. Void in all other geographic locations. No purchase necessary. Void where prohibited. Contest Period for Prize runs from 12:00 p.m. (EST) Monday, August 31st, 2015 through 11:59 a.m. (EST) Wednesday, September 30th, 2015. One entry per household per day on BobVila.com. Alternative means of entry for Drawing is available by faxing your name and address to 508-437-8486 during the applicable Entry Period. Odds of winning depend on the number of eligible entries received. See Official Rules.